Preamp mantap profesional dilengkapi sistem microphone dan piezo, bisa di blend, menghasilkan suara renyah. With the 2-band equalizer-controls (bass, treble) you will be able to adjust your personal, acoustic sound easily. The very accurate and stable tuner will take care that you will never play out of tune as it shows note and tune status. When you turn the tuner on it mutes the output signal. The SH Performer Tuner comes with a nanoflex pickup and a high quality endpin connection. When nanoflex technology was born it opened the window to the beautiful world of the natural guitar sound reproduction. 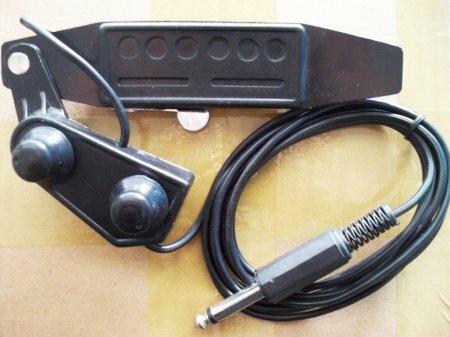 Only nanoflex pickups sense the vibrations of the strings and the movements of the soundboard simultaneously. The sound is sweet and percussive with exact attack. This gives the feeling of having a microphone mixed with an undersaddle pickup. SH Performer Tuner is completely shielded and therefore 100% hum-free. Phase switch inverts the signal and cancels the overall feedback. The LED will turn on when the battery power is low and battery should be replaced within 30 minutes. "The Shadow pickup system and eSonic2 preamp give players lots of control over their amplified sound, which can minimize headaches in performance situations where players don’t have the benefit of a sound check." 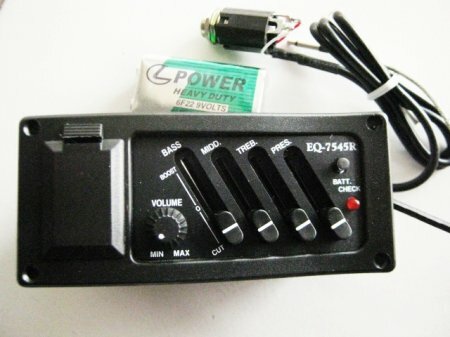 Preamp Profesional , dengan fasilitas tuner , pickup NanoMAG ( kondenser ) dan NanoFLEX ( piezo ) dalam satu preamp !! Tipe jepit, langsung colok ke ampli, jrenggg !! !